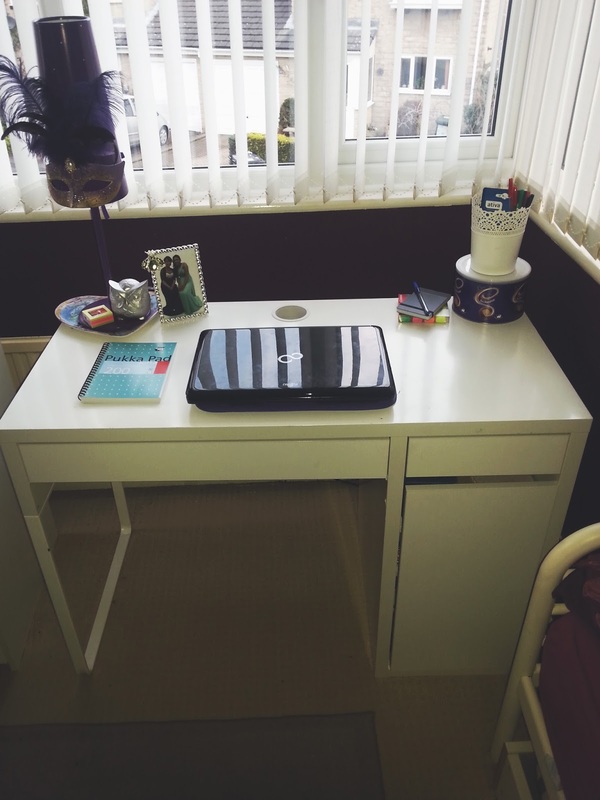 Here is a birds eye view of my desk, it is from Ikea and comes in many other colours as well as white, I like this one as you can see that it has different sections and I like to be a organised freak and keep everything sectioned up. I won't be showing you the draw on the left and the cupboard underneath as it is a state full of school stuff! Here is a birds eye view of the top of my desk, which is where all the 'magic' happens! 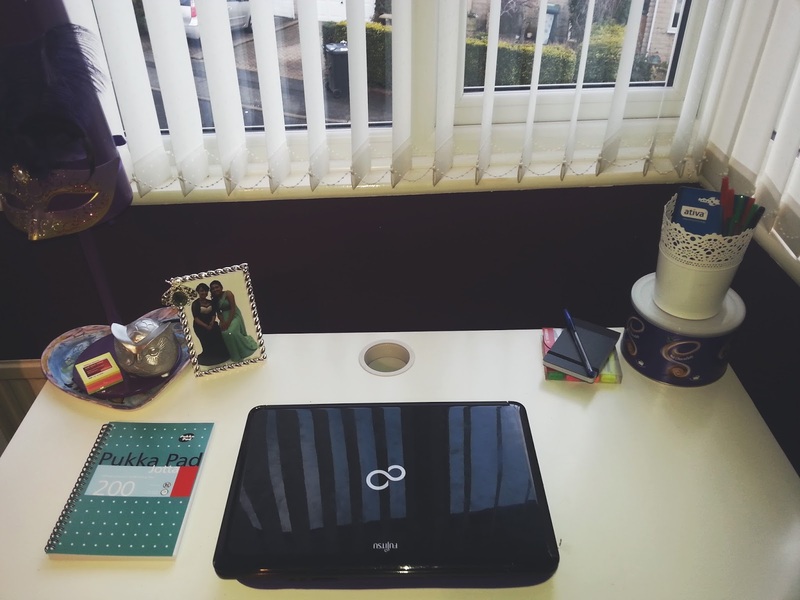 I sit here and blog, write, read as well as do all my homework therefore I keep it as tidy as I can so that everything is at hand. My desk is also the first thing you kind of see when you enter my room so I like it to look pretty and cute! Let's start on the left hand side, I have this lamp from Ikea that I love switching on at night as it lights up my room. 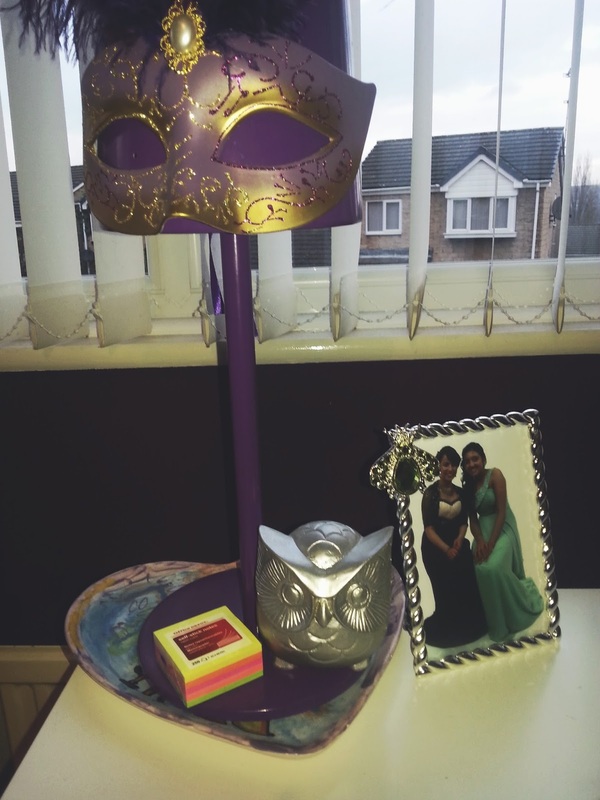 I received this beautiful mask from a good friend and it fits my whole room colour scheme of 'purple', this is standing on a plate that I decorated when I was very young! The owl ornament is something I bought at Christmas time from Store Twenty One and love how scary and pretty it looks at the same time, it used to be to hold down some papers but now I love it on its own. Next to this small but deadly owl is a pack of sticky notes, which are a absolute life saver in my opinion. There are a endless list of things you can do with them such as writing down things you need to remember to do, or even write a motivational quote down and then read it when you are working. The photo frame to the side of this, is of me and my bestie Aamira from prom that she got for me for Christmas and I love having on my desk as it constantly makes me smile! Then we move to the centre part of my desk, where I have my laptop - or in other words my life. Without this little heavy, hot machinery I would not be able to survive. I am always needing it to do some blogging, homework, or even just browsing the internet. 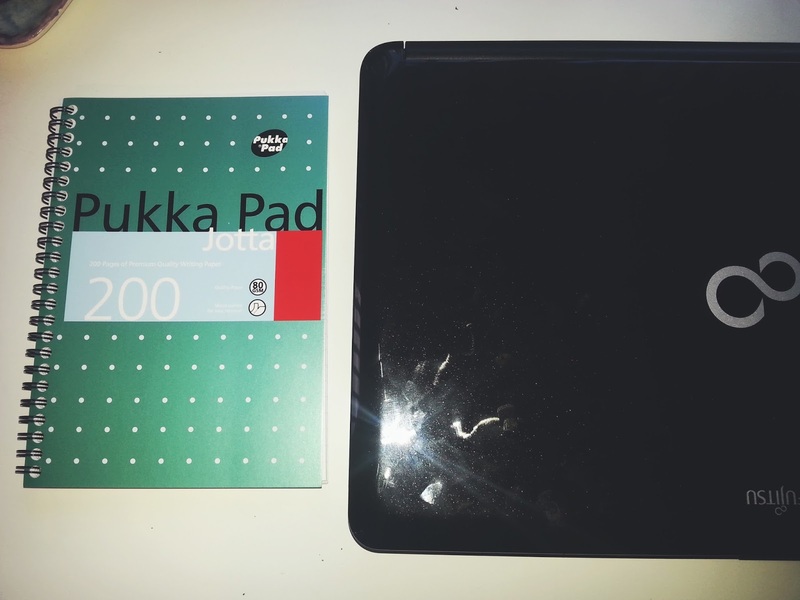 Next to it I have a Pukka Pad I am a list making freak and having this by my side is great as I can write down any tasks I need to do, or even any ideas that I have when it comes to blogging. As we move towards the right of my desk, we have the cute section in my opinion. I have some highlighters as I am always needing them for revision or even note taking as it makes everything look a lot more comfortable! On top of that I have a small notepad that is the easiest thing I have ever discovered, thanks to this I can now carry something around in all of my bags so if I ever remember anything, it is easier to note things down. 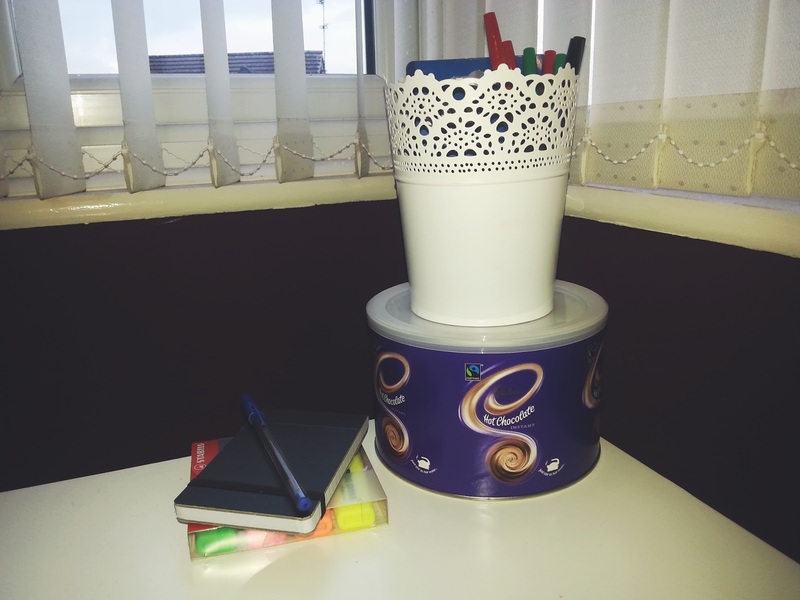 Then we have a big pot of Cadbury's hot chocolate; which it just a guilty pleasure of mine. I have recently been loving to have a cup of hot coca with some cream and it keeps me going when I am hard at work. Then on top of the treat box, I have a plant pot from Ikea that I have decided to use for something else as it is such a multi functional product. I currently have another for lip glosses and in this one I store some paper clips, rubber bands, biro pens and a memory stick for all my school work - which makes life easier as I am always needing to save work. 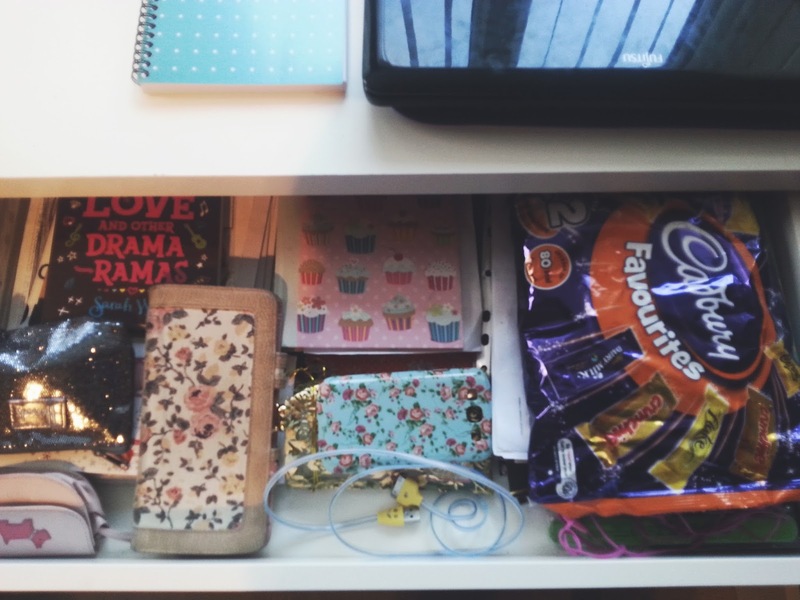 This draw is the one I use the most and is the tidiest of them all. In here I keep my purse, phone, cables and little bits of pieces. As well as some cheeky chocolate to have with that cup of hot chocolate after a long night. 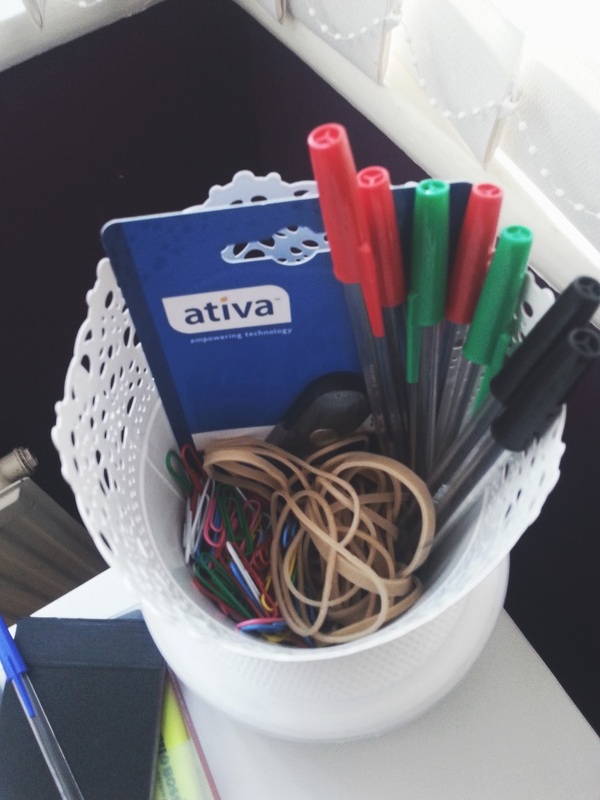 I like to keep my desk as organised as I can so that it is easier to find things when I need them. To buy all off my essentials, be sure to check out Viking where you can buy everything you need to give your desk a makeover and even colour co-ordinate everything! Hope you enjoyed this post and look out for more posts like this! Ooh I love desk posts - they're definitely my guilty pleasure!! I have that same plant pot in my dorm room! Using it for storage is a genius idea!